The new equipment collection for enduro and downhill of 100%, the R-Core-X DH model, raises the standard of manufacturing quality to another level. With elastic materials in the 4 directions, ultralight and with antifriction treatments to withstand the most aggressive Riding this new collection (maillot, shorts and long enduro/downhill pants) is one of the best performance equipment in the market in For resistance and lightness. "Hidden" zippers and zippered trouser pockets to safely store the essentials. 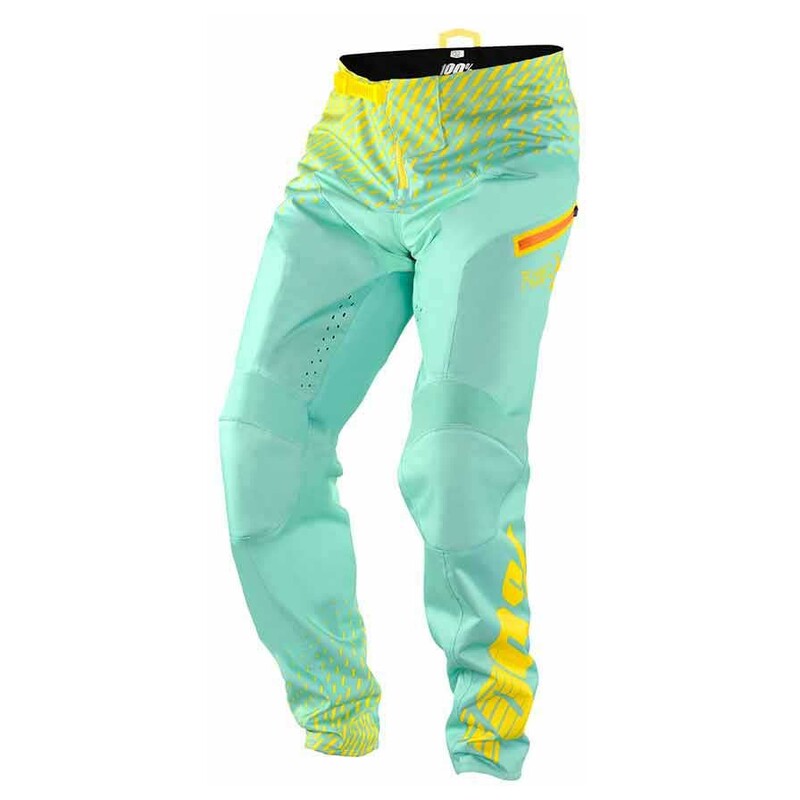 The DH NOVA Mountain biking shorts belonging to the R-Core line of the 100% brand are a perfect model for the practice of downhill/Freeride modalities. Made of very durable materials, they result in breathable, comfortable and elasticshorts. The back of the trousers has a higher design to ensure maximum comfort in attack position. Made of breathable and elasticmaterials. The new R-Core downhill jersey has been designed to provide maximum comfort and rider protection. This jersey of the mark 100% has been manufactured with polyester material with antimicrobial treatment that will guarantee a great elasticity in addition to, a fast drying of the sweat produced during the trainings/competitions with bicycle of DH/downhill and/or Enduro. The wide cut of this MTB jersey is ideal to be able to wear the right protections for maximum protection with the bicycle. Built with highly resistant polyester material. The R-Core Enduro trousers Supra that has brought to the market the brand 100% are a model specially designed for the most arriesgades modes of MTB cycling. In addition, the new R-Core Supra have been manufactured with very resistant material but at the same time provide maximum comfort when going out to train/compete with the downhill/Enduro bike. The 600d polyester used during its manufacture guarantees excellent protection. The grid fabric next to the perforated mesh liner will ensure the best feeling of aeration to achieve the best comfort. The pockets, one of which has a zipper, that incorporates this long cycling pants will allow you to keep small objects in them without fear of losing them. Made of elastic and resistant material. What do we know about the 100% brand? The prestigious brand 100% is a company Reslacionada always with the world of motocross. 100% counts along its professional career with countless emblematic moments that have created and fomented the base and history of this sport as we know it today. 100% was created at the beginning of the years 80 when its particular and famous logo adorned the great teams of motocross. Today, after more than 30 years in the market, 100% inspires a new generation of brokers. The American brand 100% manufactures its products using high-end materials in a way that guarantees the cyclist the best functionality and quality of vision. 100% – all cycling equipment: goggles, gloves and spares of goggle lenses 100%available at CoreBicycle – compare prices. In CoreBicycle you will find the best models of goggles of protection, gloves and spares of lenses of goggles of the mark 100% with the best prices being able to compare also the prices in different shops of cycling.